Veggie Tomato Cream Pasta - This pasta satiates an Indian palette to the T!! It has a pleasing colour [pink] and a great creamy texture making it favorite with both elders as well as kids. Veggies like coloured bell peppers, mushrooms, zucchinis, olives added to this yummy pasta makes it a complete and filling meal. I remember getting to know about this as a "new" dish in the early 2000 as a college student when it started making waves in India. My little sister who was a school girl and I were curious then and tried different ways to cook this versatile dish and came up with different stuff every time! Nostalgic for sure:) Today, though we get ready to eat pasta or different flavored pasta sauce off the shelf in any super market, I always prefer the home cooked simple yet tasty tried and tested sauce used in this recipe. One can be more creative by adding more ingredients to enhance the taste or the consistency of the pasta to suit tastes. All-purpose flour – 2-3 tbsp. (a) White Sauce – Heat a fry pan and add a tsp of olive oil or any cooking oil and a about a tbsp. of butter. Before the butter completely melts and changes the colour add2-3 tbsp. all-purpose flour or Maida to it and keep stirring while it cooks. Start adding milk to the mixture and continue to stir. I use a whisk to mix so that there are no lumps and we get an even consistency. Keep stirring till it comes to almost a semi solid to a pouring kind of a consistency. Add salt, mixed herbs and chilli flakes and set aside. (b) Pink Sauce- I simply add ready to use tomato puree to the white sauce and adjust the seasoning. To make it tangier add a tbsp. of tomato ketch up and mix well. (c) Pasta Al Dante – Take a big, thick bottomed vessel. To this, add sufficient water and salt. Bring it to a boil and add the fusilli and penne pastas to it. Let it cook in boiling water till its 70% cooked which in Italy is called Pasta Al Dante which means pasta cooked so as to be still firm when bitten. Soggy/Over cooked pasta is a big no-no!! (d) Chop all the required veggies, grate some Parmesan cheese and set aside. Since it was a quick pasta I have used just the onions, tomatoes, and olives. Broccoli, bell peppers, zucchinis and mushrooms if included adds to the taste and is healthy too. (e) Bringing all the above ingredients together – Take a wok/fry pan. Heat olive oil and some butter. Immediately add chopped garlic, sauté for a minute. Before it changes colour add the veggies and sauté for a couple of minutes. We shouldn’t over cook the veggies as they tend to lose the crunch which is vital for a pasta dish. To this add the tomato pink sauce (mentioned as above) and mix well. Add the cooked pasta to the mixture. 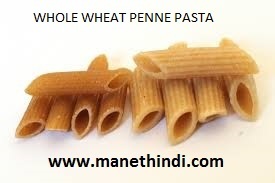 Let it come together and blend till the pasta takes in the flavours of the sauces. ­­ Check for the seasoning at this point and turn off the heat. Serve pasta in a bowl with some grated Parmesan cheese topping, chilli flakes, some fresh cream and a dash of extra virgin olive oil to finish it off. Serve hot along with some toasted garlic bread or bread sticks. Looks yummy!!!... 'll definitely try this. Thanks for sharing this Sree.